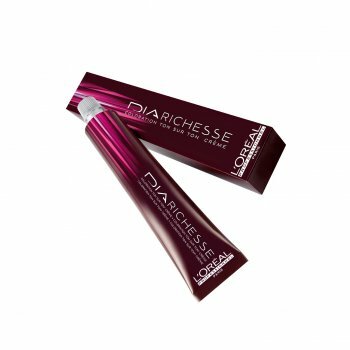 L&apos;Oréal Professionnel Dia Richesse 5.13 Chestnut is an ammonia-free colour with white hair coverage of up to 70% on base shades. Rich, deep reflects and exceptional softness. Ideal for natural hair or hair with up to 70% white hair. L&apos;Oréal have being supplying the beauty trade for over a century, with their success built upon high quality salon professional products. *This excludes college kits, furniture, equipment and other bulky items for which delivery will be quoted at the time of ordering. Our aim is to dispatch all orders within 24 hours, subject to stock availability. If an item is out of stock our Customer Service Team will contact your with an estimated delivery date or a suggested alternative. We ship throughout England, Scotland and Wales. The Scottish Highlands and Northern Ireland are excluded from online orders, however you can call 08456809657 and place your order over the phone with a delivery charge. For any queries, you can Contact Us by clicking here. During a Bank Holiday, online orders placed during the weekend will be dispatched on the following working week day. College kits will be sent to the delivery address that is provided when the order is placed, (unless otherwise stated in the 'Kit Details' section on the order forms). Where your kit is designated for delivery to your college on a specified date, if we receive your order less than 3 days prior to this date your kit will be delivered to your home address and a £5.00 ex. VAT carriage charge applied to your order. We will endeavour to deliver your kit as soon as possible. In any event, your kit will be delivered no later than 7 days before the start of your course. (provided that we have received your order 14 working days before the start of your course, excluding Bank Holidays). Please do not contact us about delivery of your kit before this time. We are happy to exchange a product within 14 days of purchase as long as the product has not been used. Additional carriage charges may apply if goods are redelivered. In the unlikely event that your product is faulty, we will happily exchange it within 30 days, provided that you have notified us in writing within 14 days of receipt of the goods. Non standard items such as furniture/special order items unfortunately cannot be cancelled. All returned items should be sent insured via recorded delivery to Dennis Williams, 9 Kingsmark, Freeway Euroway Trading Estate (west), Oakenshaw, Bradford, BD12 7HW. Please note that you will be responsible for the costs of returning the goods to us unless we delivered the item to you in error or the item is faulty. We do not collect goods. www.dennis-williams.co.uk will charge a £5.00 handling charge per order, or 10% of the value, whichever is greater. No refunds will be made in respect of carriage charges levied on the original order. Dennis Williams is entitled to make a charge for damaged or missing items. This may affect the total amount credited to you. Please refer to the returns policy on your college kit order form for the college kit specific returns and refunds policy.